The Wondershare Video to iRiver Converter application was designed to be a professional video to iRiver converter that will convert regular video formats to iRiver WMV for playback all types of iRiver players. This iRiver video converter can also extract and convert audio from video to iRiver audio formats including MP3, WMA and OGG. 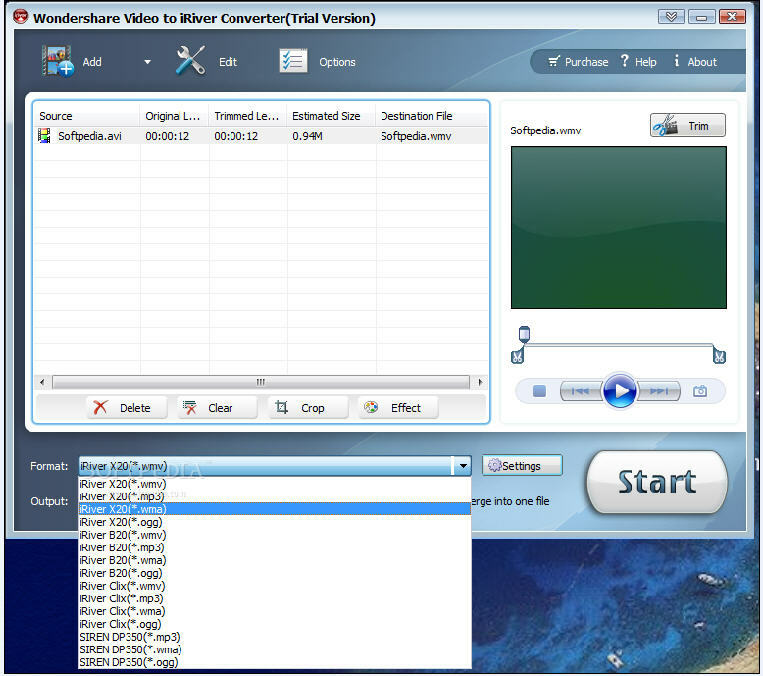 Convert video to iRiver WMV with high output quality. Extract audio from video to WMA, MP3 and OGG for playback on your iRiver and other audio players. Convert multiple video files at a time. Provide complete video and audio output settings to convert your video files. Crop your movie video to remove the black video sides. Trim video file length to capture and convert your favorite video clips. Merge all added video files into one file. Preview your video files and capture your favorite pictures to save on your computer. Put video on iRivers and players with just a few intuitive steps. Wondershare Video to Walkman Converter is a good video to iRiver converter, with it, you can enjoy many kinds of video on your iRiver. Wondershare DVD to iRiver Converter - DVD Video to iRiver Converter - Convert DVD to iRiver WMV and iRiver audio formats including MP3, WMA and OGG. Wondershare DVD to Walkman Converter - DVD to Walkman Converter - Convert DVD to Walkman video MPEG-4/AVC and Walkman audio formats including MP3, WMA and M4A.